The Young Winos of LA sont sur l’air! 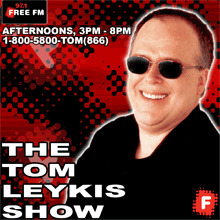 After two and a half years of toiling in some sort of nebulous audio-free obscurity, the Young Winos appeared last night on their first-ever nationally syndicated drivetime radio show, 91.7 FM’s “The Tom Leykis Show.” Tom’s an avid wine lover, and he was generous enough to give us about forty-five minutes of airtime to talk about the group, share our thoughts on wine, and field calls from listeners interested in everything from which wine to pair with steak, to that strange “tartness” that one sometimes experiences when drinking reds. You can listen to the podcast by clicking here. Also, we’ll be appearing on Tom’s other show, “The Tasting Room,” which airs on 91.7 FM this Sunday at 5pm. Tune it up! I heard the pod cast of the Tasting Room and I wanted to know which wines you were tasting. I wasnt sure how to spell the names and really wanted to get them so I may try them out. A great value wine from Spain, and one that loves food. 89 points in Parker’s Wine Advocate. $12. Jordan and I tasted this 100% Sauvignon Blanc last night, and it’s awesome. Huge nose of honey and mineral elements simultaneously, vanilla bean, grassy and herbaceous, “like a hay field in a glass.” $20. This was one of our LA Times picks — we described it as follows: “A big slice of fresh-baked cornbread smothered with honeysuckle jelly. Always fun to find a creamy, well-oaked white that isn’t Chardonnay.” $32. This is a fun German white made from the Scheurebe grape which is described as very much like Riesling, but a little fatter. $20. This was one of our LA Times picks — $6. Delicious, spicy, goes great with barbecue. $15. The ’05 was #17 on Wine Spectator’s Top 100 recently. $32.